​Waves slapped the side of the car ferry as we left the port of San Jorge on the Nicaraguan Mainland. 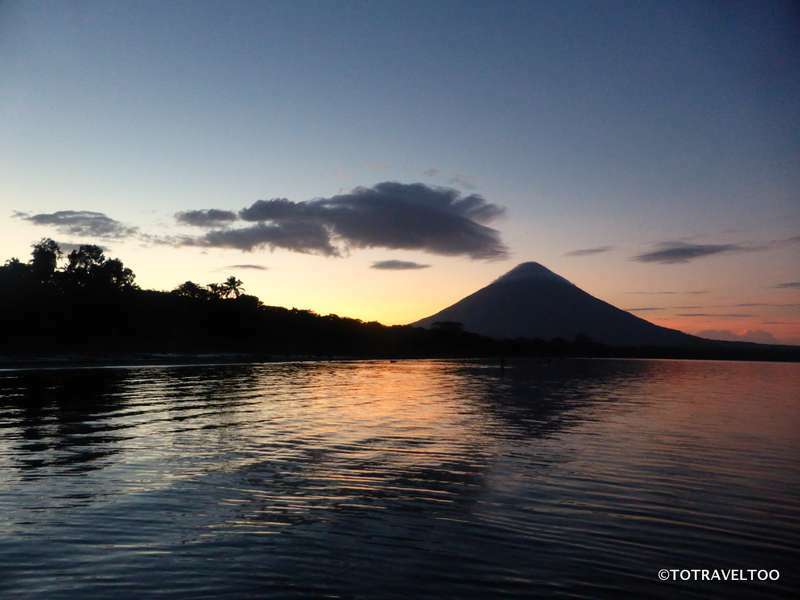 Ometepe Island is an hour away but what dominates the skyline is one of two Volcanoes – Concepcion still active, a perfect cone shaped mountain standing proudly at 1610 metres high. Ferry passengers wander to the bow of the ferry mesmerized by the looming volcano, selfies are taken and a few serious photographers with expensive cameras and lenses spend time working on that one good shot. 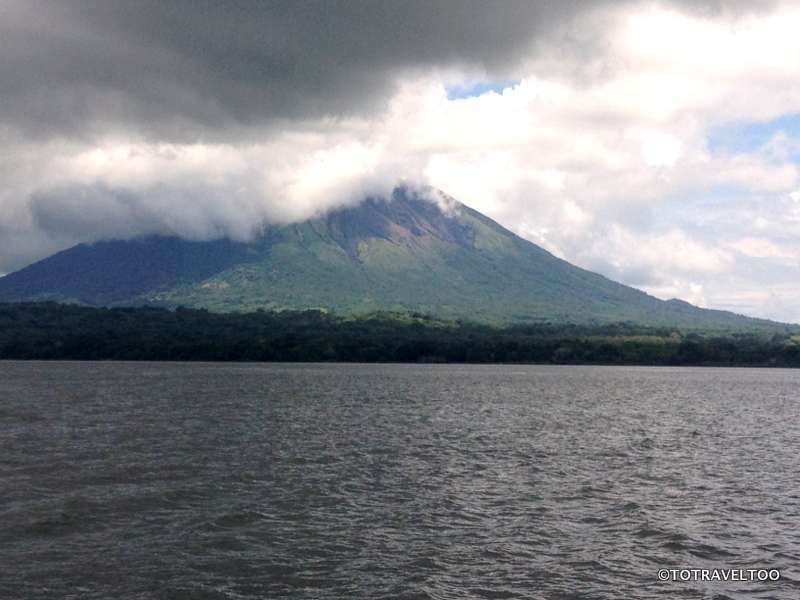 We were heading to Ometepe Island for 3 weeks of house sitting in a small village close to Ometepe’s other Volcano - Maderas that dominates the skyline as well but sits lower at 1394 meters. Maderas is now extinct but those who can, hike the 7 hours to the top and experience the dwarf cloud forest and the stunning views over the island and Lake Nicaragua. Ometepe comes from Nahuati Ome (two) Tepeti (mount) and means ‘Place with two Mounts or Volcanoes’. They both sit majestically on the largest freshwater island in the world that is 276km2. The island’s first inhabitants were the Nahua Indians from Mexico, later inhabitants who established important settlements were the Niquirano Indians. 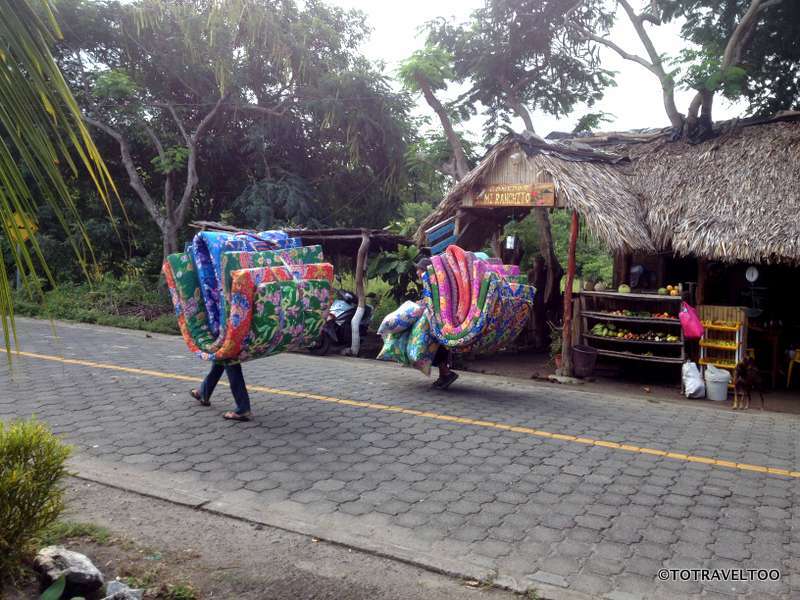 More religious and folk festivals happen on Ometepe Island than anywhere else in Nicaragua, the local inhabitants keeping ancient traditions alive. The one hour $2USD passenger, car ferry crossing can either be smooth or rough depending on the local wind, luckily ours was smooth. 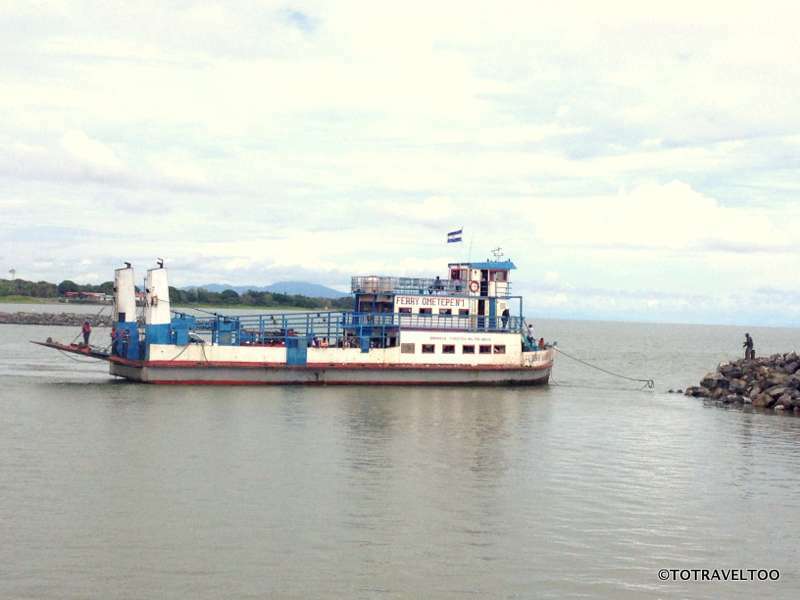 There are smaller boats (lanchas) but we were advised to take the ferry. It is one of the cheapest ferry rides we have had and the most scenic. Arrival at the port and the largest town on the island, Moyogalpa, can be chaotic. The ferry docks, locals and travellers push ahead to be the first to disembark but are blocked by trucks, cars and bikes. Once off the boat, waves of local taxi drivers, descend on you like flies, trying to grab your bags and lure you off to their aged taxis. Our driver was waiting and we travelled through the town past the small local church and hit the first traffic jam of our journey. A large herd of cattle dominated both lanes of the road and were in no hurry to move out of our way. Ignoring the horn, they stopped in front of us, some pulled at tuffs of grass on the side of the road, flicked their tails and moved on to the next patch. Maneuvering through that jam we then encountered our next, which was a small herd of horses taking up both lanes, but at the sound of the horn they parted and we passed slowly through. ​Life is very slow paced on the island. 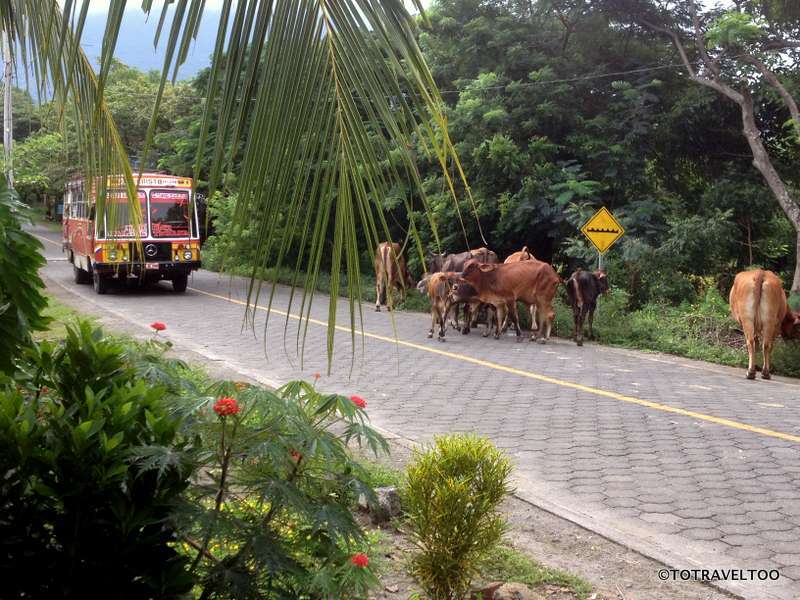 Travellers and locals share the beaches with cattle and horses that roam freely at different times of the day. Pigs, led to the lake, by ropes around their neck, are bathed in the warm waters of the lake. At sunset, families head to the lake to fish for sardines. 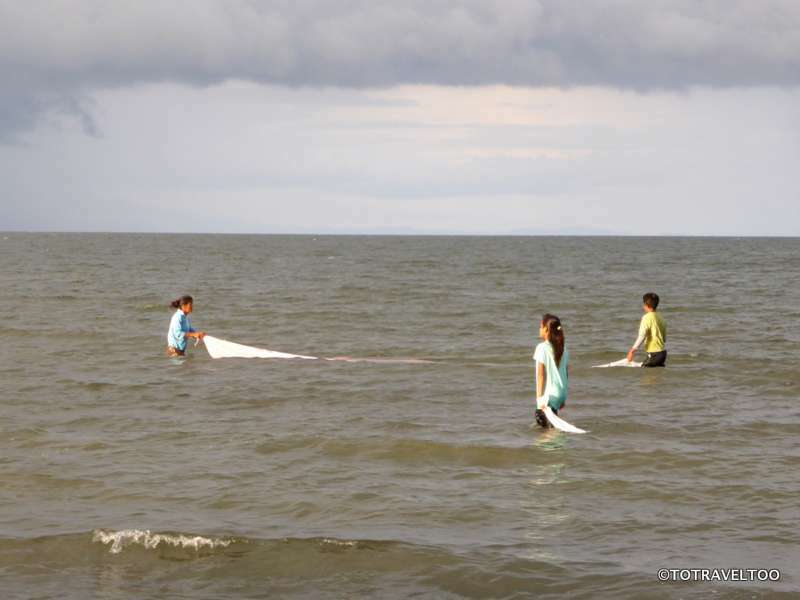 A traditional method still practiced today – two hold a mosquito net at either end that skims the top of the lake whilst a third suddenly runs towards the net, hopefully frightening the fish enough that are then caught up in the net. Activities on the island include hiking up both Volcanoes. These are quite strenuous hikes but an easier one and the most popular is a hike to the ‘petroglyphs of Por Venir’ and ‘Mirador’ the lookout. San Ramon Waterfall is another hike taking 4 hours up a steep path to a picturesque 35m waterfall. After all this hiking a visit to the mineral springs for a swim to cool down at Ojo de Agua near Santo Domingo is highly recommended. ​A visit to Charco Verde (the Green Lagoon) situated in a Reserve that is a place of mystery and beauty. Stories are told of an ancient witch who appears to visitors as a man swimming or fishing in the lagoon. The witch or Chico Largo as he is known protects the tomb of Cacique Nicarao but is known to offer you a life of luxury in exchange for your soul. Small businesses around the island rent out bicycles, horses and kayaks for a small fee. Local comedors (family run restaurants) are scattered through the island offering local fare and fresh fish from the lake. We were living with comedors in front and at either side of us. When the local beer truck arrives with its load of the local Nicaraguan beer Tona three times a week, we purchased a case of 12 large bottles for approximately USD16. Several fruit and vegetable trucks regularly arrive and provide local produce to the comedors and allowed us to purchase directly from them. Bread trucks, fish trucks, and locals with melons, bananas or pineapples turned up at our door at various times of the day. One sight that we had never come across before, or probably never will see again, were two mattress salesmen balancing mattresses on their backs walking down the road yelling their sales pitch to all. ​Sunsets are magic moments on the lake. Colours range from deep pinks and oranges to hues of blue as the sun dips behind Volcano Concepcion. Another day in paradise comes to a close early as dark descends around 6pm.